Would love to know the name of the pink flower. - Can you give any detail on some of the plants in the photo? How do you deal with raking when the leaves fall? What is planted to the right and left of the Azalea in the front part of the picture? Pink flowers - Are these pink flowers Azalea's? Hi yes they are. Azalea 'Aphrodite' I believe. Make your space feel much larger than it actually is. An eighth-acre of forest feels much larger than 1 acre of open terrain because you can’t take it all in with one glance. Unlike gardens with full sun, you have to move through a shade garden to see it all. Here’s a second virtue to consider: A pathway through the woods beckons you precisely because you can’t see what’s at the end of it. The Right Plants for Your LandscapeYour location will influence most of your decisions about what is suitable for your patch of land. Lush and green terrains like the one in the Washington, D.C., area, above, have different considerations than a dry or drought-prone landscape like the one in San Diego, below. But no matter where you live, some general rules of thumb apply.Avoid invasive plants. Beware of trees that spread aggressive roots or shrubs that will grow too large for the location in which you plant them.Avoid plants that require excessive shearing. Landscape maintenance ultimately requires the use of tools and services that consume energy to get the job done, whether that be workmen to drive to your location or equipment that burns fossil fuels. Benjamin Vogt / Monarch Gardens added this to Stop Fighting the Patchy Lawn! 1. Azalea walk. 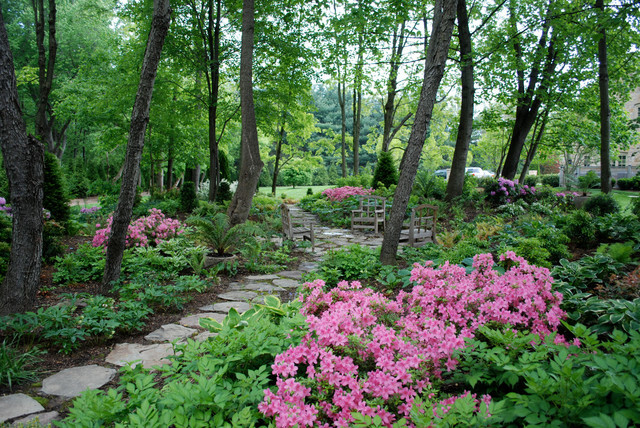 Bordering a flagstone path curving beneath mature trees in Great Falls, Virginia, a combination of shade-loving hostas, delicate hellebores and frothy pink ‘Aphrodite’ azaleas turns the shaded area into an inviting woodland destination. A classic choice for bringing color to shade gardens, azaleas and other members of the Rhododendron genus thrive in dappled light and bloom from early March to May, depending on cultivar, with some late-season varieties blooming into fall.Plant combination:‘Aphrodite’ azalea (Rhododendron ‘Aphrodite’, USDA zones 6 to 10; find your zone)Hellebore (Hellebore sp., zones 4 to 9) Hosta (Hosta sp., zones 3 to 9)Water requirement: Regular; keep soil moist for hostas and azaleas.Light requirement: Partial shade; dappled light is optimal. Sit in the shade surrounded with mostly natives, and some eye popping annuals.